Home > Wedding Supplies > Bunting. 4 Meters of Party / Wedding bunting. Made from 160gsm red paper so its double the thickness of the 80gsm paper bunting. 4 meters of double sided white satin ribbon included for you to thread your flags on. Photo shows 1 meter of bunting which includes 7 flags, We are supplying 28 flags for the 4 meter kit but you can choose to use less flags for a spaced out affect. Holes are already punched into the flags. Get the kids to help you with making the bunting up, You could even let them draw on the flags with pens or pencils - with supervision of course. Flag size is 135mm wide x 195mm long. Please keep the satin ribbon supervised to avoid anybody, Especially babies and children from being strangled. We have a good colour selection for you to choose from. If you want to mix colours then you will need to buy a pack of each colour and mix them yourself. 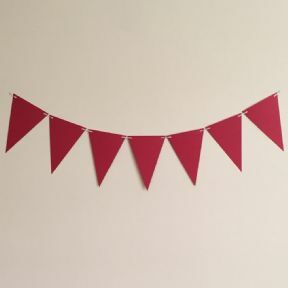 If you're interested in ordering a large trade quantity of this item (Red Wedding and Party Bunting - 4 Meter Kit) then email us and we will send you a quote. Please note that this is not possible on some items. Please include the quantity and item(s) in your email. All quotes are sent via email. You can use the "contact us" form on this website for quotes.